THE SALTON SEA COULD BE AN IDEAL BACTERIA BREEDING GROUND. DETECTED LEVELS ARE LOW SO FAR, BUT ELSEWHERE, PEOPLE AND PETS HAVE DIED. 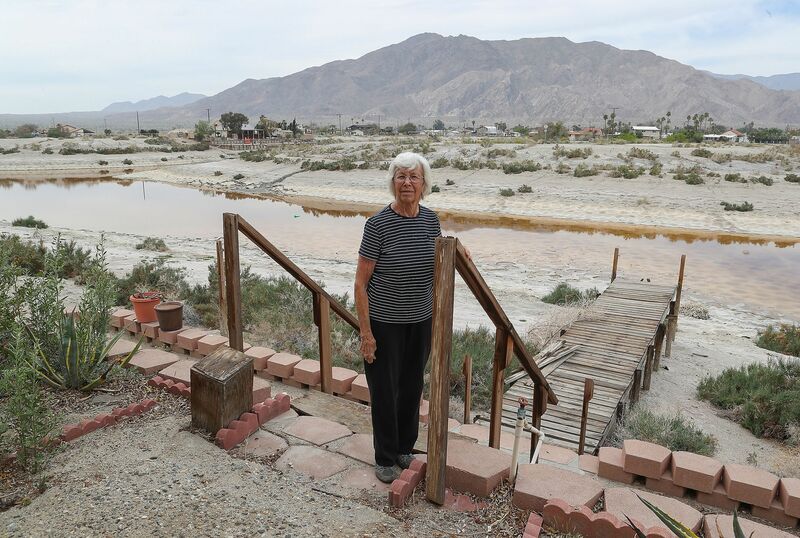 Hot weather is on its way, and with it, potentially toxic bacteria could bloom rapidly in California’s largest lake, the Salton Sea, and other waters on the receiving end of runoff from farms and golf courses or sewage spills. With temperatures across the desert expected to climb high into the 90s by Monday, experts say telltale signs will quickly appear. Algae mats, foamy scum and off-color water all can contain microscopic cyanobacteria that gobble up fertilizers or waste and, using the sun for photosynthesis, explode with new growth. While many of the bacteria are harmless, some spawn nasty toxins that can cause convulsions, liver damage and other serious health concerns, officials say. "As we head into warmer weather, what people should look for is discoloration that doesn't match surrounding water, especially scum or foam on the surface or the shoreline. Those are the really possibly hazardous areas you want to avoid," said Jeff Geraci, senior environmental scientist with the California Regional Water Quality Control Board, which oversees the Colorado River region. Geraci has done testing at the Salton Sea for two years. Most at risk are pets and children, who may play in shallow waters and accidentally drink or inhale dangerous toxins. There is no known treatment for exposure. "Dogs are very attracted to scum. Even if they don't eat it, they're going to lick their fur and ingest cells that contain the toxins," said Geraci. "What you’ll observe in the animal is they go into convulsions and within an hour they're usually dead." The problem is growing up and down California and around the world, experts say, typically wherever industrial agriculture is situated near water. A spot like the Salton Sea, which exists because of agricultural runoff and an often sewage-polluted river, and which enjoys long, sunny days and often still waters, is an ideal possible breeding ground. To date, levels of detected toxins there have been low, but they're there — enough on occasion to trigger caution signs, but not full closures or danger signs. "We do have cyanobacteria at the Salton Sea ... seven different species. As far as toxins, we've observed three: anatoxin-a, microcystin and saxatoxin," said Geraci. Anatoxin-a and saxatoxin are potent nerve poisons, and microcystin has been connected to symptoms ranging from sore throats to severe liver damage. Just like green plants, all thrive when an overabundance of nutrients exists — particularly phosphorus from fertilizer runoff. "In the warmer months it's much more prevalent, because cyanobacteria prefer ample sunlight, full sun, and they like warm, calm waters," Giraci said. "Some are naturally occurring, but the majority comes from the fertilizers from the agriculture there." While the levels observed so far are below World Health Organization amounts identified as dangerous, Geraci said, "just keep in mind, blooms can occur rather suddenly, with the potential to change to toxic conditions just as quickly." And as the sea shrinks due to the diversion of waters to urban areas, more of the cyanobacteria and other contaminants that currently lurk in the deeper benthic zone could be exposed, he and others said. Cyanobacteria, sometimes called blue-green algae, have been around for billions of years, and can also be red, purple, brown or pink. They can live in everything from snow to the ring of water around a lawn sprinkler. But as large-scale agriculture and improved testing technology have surged, "toxic algae" are being recognized as a growing problem worldwide. Phosphorous and nitrogen are the main culprits, and can be present in human or animal waste too. The exact mechanism that causes poisons to develop where farm runoff and warm water collide is being researched, but several studies have established the link, said Thomas Van Lent, director of science and policy at the Everglades Foundation in Palmetto, FL. He compared the runaway spread of bacteria when conditions are right to a forest fire. Read full article (It is superb) . . .